What’s the Best Way to Explore Archaeological Sites in Mexico City? Heading to one of the biggest cities in the world can be an overwhelming experience with mercados to visit, colonial architecture, and great restaurants. However, you can’t leave without visiting some of the archaeological sites in and around Mexico City—many are just around the corner. By foot, If your hotel is near the Historic Center. Right by the Zocalo —between Seminario and Justo Sierra streets, El Templo Mayor was dedicated to two gods Huitzilopochtli and Tlaloc. You will find mostly ruins of what is left after it was destroyed by the Spanish in 1521. Visiting the Templo Mayor museum can bring you back to what it was like back when Aztecs lived in their capital city of Tenochtitlan, now Mexico City. By bus, tour operator or a private ride. This might be one of the best trips you could do while in Mexico City! Even though you have a few ways to get there, I did take the bus as it was cheaper. Keep in mind that there will be some bus/train transfers to get to the “Terminal del Norte” where you can get on an almost express bus to the pyramids. Located just about 45 minutes from Mexico City, the Teotihuacan Pyramids will make you feel as if you’re traveling back in time. 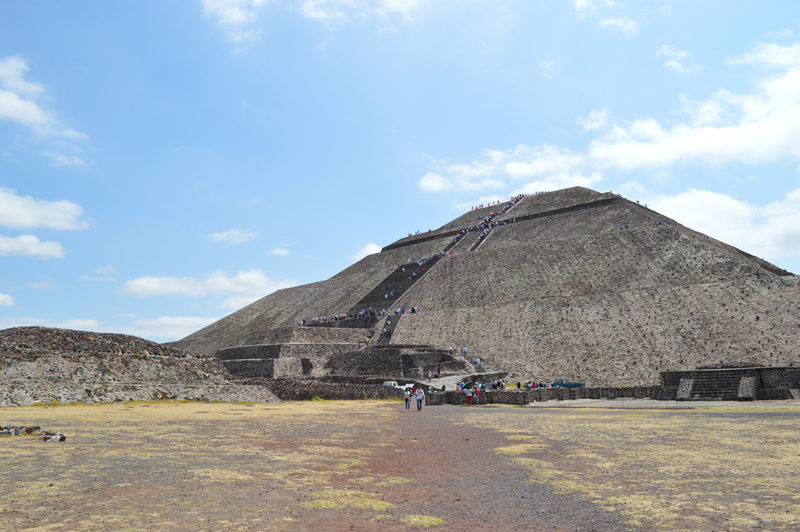 Here, you have the opportunity to hike to the top of the Sun Pyramid and to the first slope of the pyramid of the Moon. Walk the Avenue of the Dead and get a great workout going up and down the many steep steps. Get there early in the morning if you want to climb the pyramids since it will get busy later on the day. Bring cash as there are no ATMs around, only in the next town. Bring your own water. It will be hot and exploring the entire area takes time. You will find plenty of vendors for some souvenirs from jewelry to toys. Don’t forget to barter.